Action figures, dolls, space toys, robots and scale farm tractors bring in a variety of visitors to this booth. 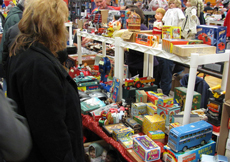 There's a collectible item for everyone at the Tinley Park Annual Holiday Toy Show. Contact Jim Welytok at Unique Events Specialty Shows for more information on new and vintage collectible toy shows in the Midwest. Every Spring and Fall we hold shows in Illinois, Wisconsin and Michigan. Some specialize in brewery collectible advertising, such as beer signs and cans, and others are geared toward Antique Toys, and others are for the scale model car crowd. Whether you're looking for a vintage robot, a classic scale promotional car, or a collectible doll, we have the right show for you.